Homemade spaghetti isn’t rocket science. Really, you don’t even need a pasta machine to make pasta. All you need is a clean, smooth surface and a good rolling pin. After years of lusting after a real pasta machine I finally got my hands on one back in November and it’s been firmly in use most weeks since then. The kids love to make pasta with me. From mashing the dough together and kneading it in the early stages, to pressing the dough through the rollers and cranking the handle to turn them, pasta is a family occasion. 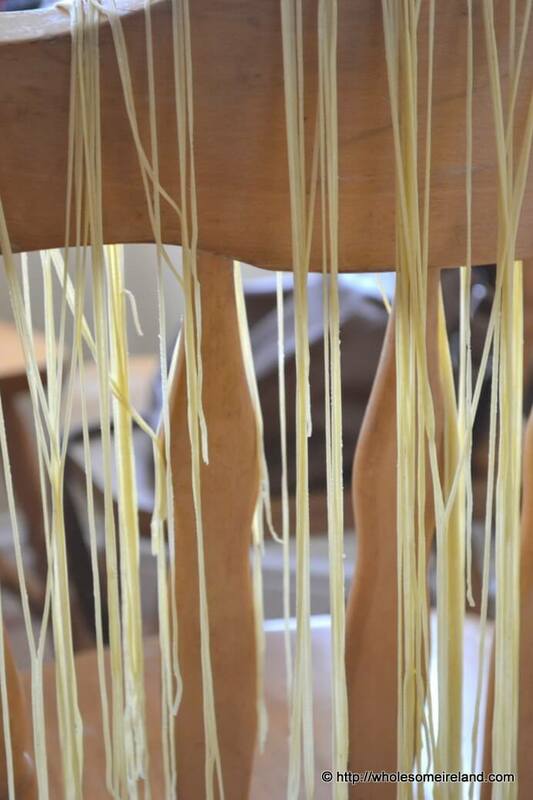 We set the pasta to dry a little on the back of the kitchen chairs before cooking it. The boys lightly touch it as they pass by and watch the strands swing. They’re always eager to cook the pasta after it has been shaped. The silky smoothness of fresh homemade spaghetti has no comparison to anything we can buy in the shops, in Ireland anyway. I’ll have more pasta recipes for you in the future, along with plenty of sauces but this is a big favourite with all the family because it’s so simple. We had a few extra to tea yesterday so tweaked the recipe to feed many. If you’re very stuck for ingredients you can use plain flour but allow for a longer resting time in the fridge. Blend together the egg and flour with a fork in a large bowl until you get a texture like breadcrumbs. Turn the “breadcrumbs” out onto a large clean surface and gather them together using clean hands. Compress until you get a large piece of dough and knead until you can feel it stretching. I know some recipes say to knead for only 2 minutes, I normally have to knead for at least 5 to get the right texture. Take a large piece of cling film and wrap the dough tightly then put it into the bottom of the fridge for 2 hours. After 2 hours, remove the dough from the fridge and roll it thinly (use a pasta machine if you have one). Then section into thin strips for spaghetti. Dry on the end of a chair if you can while you bring as big a pot of water as possible to the boil with a good sprinkling of salt inside. Once the pot comes to the boil, take a big spoon and swirl the water into a vortex. Pop the spaghetti into the middle and stir again. Let the water come back to a boil and cook for 3 minutes. Strain the water from the spaghetti. I normally do this by pouring the entire contents of the pot into a colander in the sink. Then return the pasta to the hot pot with the butter. Stir through the butter as it melts. 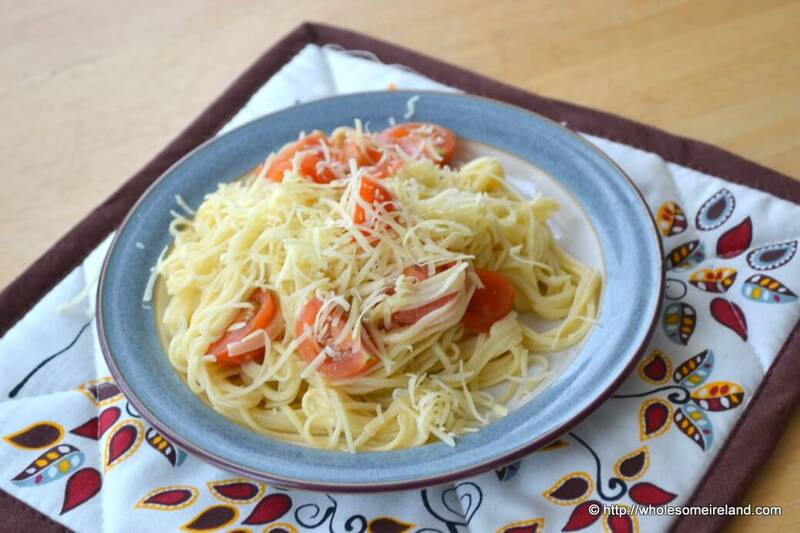 Add some sliced cherry tomatoes and serve with the grated cheese at the table so people can add as much (or as little) as they like. Honest to goodness I thought it would be intimidating because I’ve been making fresh pasta for a while and it had become a chore. 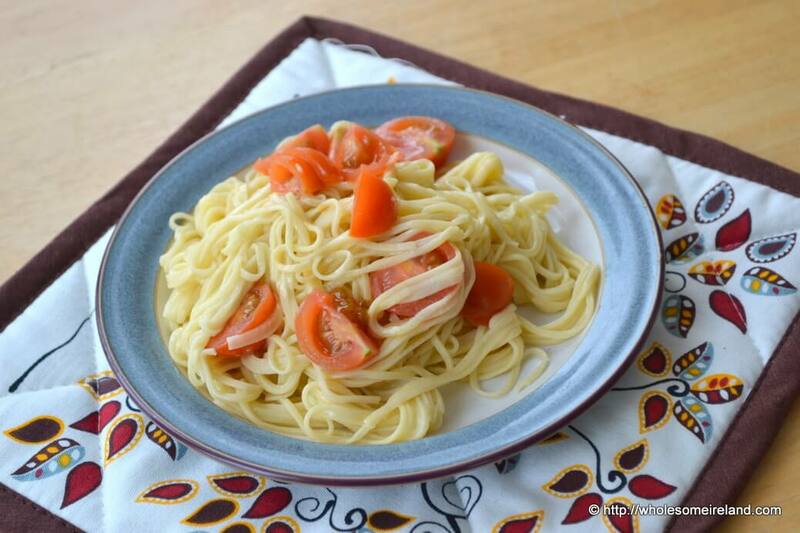 The pasta machine has made it incredibly easy and become an integral part of my kitchen! I haven’t made homemade pasta in so long, it always seemed so time consuming. This has inspired me to try again though! I guess it might appear time consuming because you do need the foresight to make the dough in advance. Mind you it just becomes part of our day here so it’s not like I have to set time aside to do it. Making the dough takes about 15 minutes, then rolling/cutting another 15 minutes. Cooking is the quickest part!